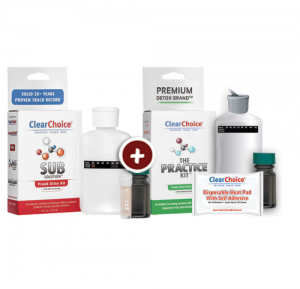 Thousands of Clear Choice customers each week ask the best way to heat their Synthetic Urine Kit. They wonder how to use the heat activator powder and if they should use the heat pad with or not! Well, the brains at Clear Choice have solved another problem. Now available, The synthetic Urine Practice Kit designed especially for your Sub Solution synthetic urine Kit. If you do not see any temperature reading, carefully add 1/3 of the powder into the mixing container. If the temperature indicates 82′-92’F add 1/4 of the powder instead. Tighten the cap gently, shake and wait 15-20 seconds before taking a new temperature reading. *Please use responsibly – our products are not intended to be used on lawfully administered tests and is to be used in accordance with all federal and state laws.